Research in our laboratory is focused around a common theme to understand how neuronal activity and cellular calcium signaling modulates neuronal response and regeneration following cellular damage. Employing the nematode worm C. elegans as a simple yet powerful model system, we pursue in vivo studies at both the single neuron and small circuit levels. Through our work and that of others, C. elegans has recently emerged as a powerful system for the study of neuronal damage and regeneration, following a long tradition of seminal findings in C. elegans with direct translation to mammalian systems. For our specific purposes its simple, completely mapped nervous system, small transparent body and amenable genetics make C. elegans an ideal test bed for novel biophotonic techniques and applications. The results are exciting, technologically driven breakthroughs that are pushing current understanding in regenerative neurobiology and small circuit function. As such, our laboratory is truly cross-disciplinary with engineers and biophysicists working side-by-side with traditional biologist. The technical expertise and ongoing research projects in the laboratory are as follows. 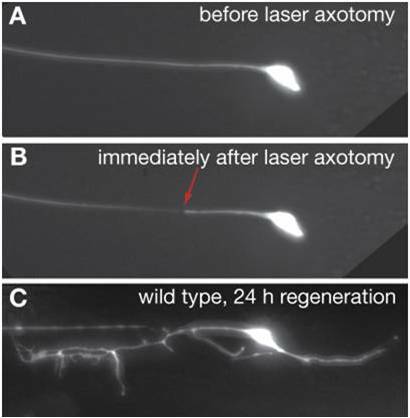 FIGURE 1 (above): In vivo neural regeneration after femtosecond laser surgery in C. elegans. (A) A C. elegans neuron before laser surgery. (B) The same neuron immediately following laser surgery (red arrow indicates the break point). (C) 24 h after surgery, the neuron displays substantial axonal regeneration in wild type adults. •Fluorescent Calcium Imaging: Employing genetically encoded fluorescent calcium indicators, we can optically measure neuronal activity and cellular physiology in vivo. Combined with laser surgery this allows study of cellular calcium signaling and neuronal activity in response to specific cellular damage. •Quantitative Behavioral Measurements: Computer automated tracking of C. elegans allows quantitative measurement of animal behavior and its alteration by acute laser dissection of specific neurons. Following neuronal damage, dramatic “calcium overload” can lead to cell degeneration and death, while subtle calcium signaling is essential for outgrowth and guidance of a regenerating axon. Despite its obvious importance in mediating neuron fate following insult, little is known of the localized intracellular calcium dynamics that occur in vivo within an injured neuron, or of the molecular components that modulate them. Our biophotonic techniques allow unprecedented high resolution in vivo time-lapse imaging of intracellular calcium dynamics and regenerative outgrowth following laser severing of a specific neuron. The quantitative nature of our single neuron regeneration assays coupled with the power of C. elegans genetics facilitates rapid and comprehensive analysis of pertinent genetic mutations, generating new insight into the molecular mechanisms that govern neuronal calcium response to damage. As such, our uniquely powerful experimental system is addressing critical gaps in the field of regenerative medicine that to date, despite intense effort, is largely ineffective in the treatment of traumatic neuronal damage and neurodegenerative diseases. By defining molecular mechanisms that mediate cellular calcium signals and their targets, our work will ultimately point to novel neurotherapeutic strategies that improve neuronal survival and recovery. In our recent study, we demonstrated that the CED-3 caspase, well known as the core apoptotic cell death executioner, acts in early responses to neuronal injury to promote rapid axon regeneration in C. elegans (Pinan-Lucarre et al. PLoS Biology, 2012). This was the first evidence of a constructive role for caspase activity in neuronal repair and follows other findings implementing similar mechanisms in a wide range of neuronal processes including neurite pruning and synaptic modulation in vertebrates. A critical element of such mechanisms is the precise localized control of caspase activity while not inducing generalized apoptotic cell death. Our study implicated a novel calcium mediated caspase activation pathway during regeneration, which we are now working to define on a molecular level as part of our continued and productive collaboration with Prof. Monica Driscoll (Rutgers University). Tragically, mammals display weak neuronal regeneration within the central nervous system following traumatic neuron damage. One of the most exciting discoveries in neurotherapeutics is that mammalian neurons can strongly regenerate their central axons into and beyond an injury site if a conditioning lesion is made on their peripheral sensory axons. This lesion conditioning effect has been studied in mammals for several decades, yet is still relatively poorly understood. Employing subcellular-resolution femtosecond laser ablation we observe a strong lesion conditioning effect in the sensory neurons of C. elegans. Ablation of the sensory dendrite conditions the neuron for axon regeneration that would usually be lacking. Thus, we are establishing C. elegans as a novel model system for the study of lesion conditioning, with the goal of defining specific molecular pathways that modulate it. Acute laser severing of specific target neurons within the simple C. elegans nervous system presents a unique opportunity to study damage response and homeostasis within a completely mapped neuronal circuit in vivo. Within this context, we have made provocative findings by focusing on the beautifully simple circuit controlling the C. elegans touch reflex. Laser severing of either the anterior or posterior mechanosenory neurons results in an initial hyperactivation of the downstream circuitry and elevated execution of touch avoidance behaviors (i.e. bouts of reverse or increased forward movement). Over time the animal recovers and its behavior returns to its original baseline level. Employing automated computer tracking of C. elegans behavior, fluorescent calcium imaging of neuronal activity, optogenetic stimulation of circuit components and genetic analyses of relevant neuronal modulators, we are elucidating the molecular and network signaling mechanisms that facilitate this level of homeostatic plasticity within a very simple neuronal circuit following laser damage. Neuronal damage and sensory deprivation are known to elicit hyper-excitability and neuronal remodeling within the mammalian central nervous system. Prominent examples include phantom pain of amputated limbs, acute seizures and epilepsy resulting from traumatic brain damage and cortical rewiring after spinal cord injury or sensory deprivation. Employing the simple C. elegans nervous system, its powerful genetic techniques and our unique biophotonic capabilities, we are shedding new light on the mechanisms of homeostatic plasticity and network modulation following neuronal damage. If you are interested in joining our group, please inquire at the address below.